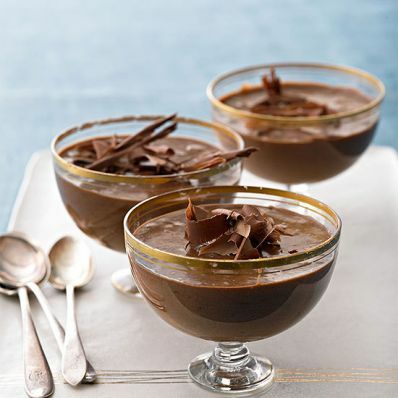 1 of 4 Place chocolate in a microwave-safe bowl and melt in microwave, stirring after each 10-second increment, until smooth, about 1 1/2 minutes. Let cool slightly. 2 of 4 Place egg yolks and 1/2 cup of the sugar in a medium bowl and whisk until pale yellow. Whisk in olive oil, coffee, salt and, if desired, orange zest until combined. Add melted chocolate and whisk until smooth. 3 of 4 Beat egg whites in the bowl of a stand mixer or with a hand mixer until soft peaks form. Gradually sprinkle in remaining 1/4 cup sugar and beat just until stiff peaks form. Add a generous spoonful of the egg white mixture to chocolate mixture. Stir firmly until completely incorporated. Pour chocolate mixture into bowl of egg whites. Gently fold with a large spoon or rubber spatula until completely combined. 4 of 4 Divide mousse into 6 dishes and cover with plastic wrap. Refrigerate overnight.